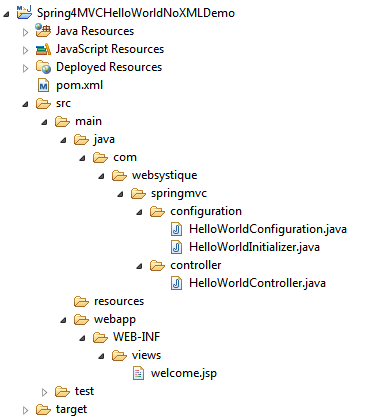 Spring MVC 4 HelloWorld Annotation/JavaConfig Example, step-by-step learning Spring MVC 4 annotations, project setup, code, deploy & Run, in simple way. Let’s get going. In the previous Spring MVC 4 Hello World tutorial-XML example, we have developed a Hello world web application using XML configuration. However, XML is not the only way to configure spring application. Alternatively, we can configure the application using Java configuration. If you look back on previous post, you will find that there are mainly two places where we have used XML configuration. First, in spring-servlet.xml where we have defined a view-resolver for identifying the real view , and location to search for beans via component-scanning. Second, in web.xml, we have defined the front-controller configuration and the url pattern it will be looking on. In this tutorial, we will again create a Hello world example but using Java configuration this time. We will REMOVE both of above mentioned xml files and replace these xml configurations via their java counterparts. Post Creating a maven web project with eclipse contains step-by-step instruction to create a maven project with eclipse. Following will be the final Project structure. Now let’s add/update the content mentioned in above project structure discussing each in detail. First thing to notice here is the maven-war-plugin declaration. As we will be completely removing web.xml, we will need to configure this plugin in order to avoid maven failure to build war package. Second change is the inclusion of JSP/Servlet/Jstl dependencies which we might be needing as we are going to use servlet api’s and jstl view in our code.In general, containers already contains these libraries, so we can set the scope as provided for them in pom.xml. Additionally, maven-compiler-plugin has been added here to explicitly specify the jdk-version we are going to use. Do note that it also forces eclipse to respect the jdk-version being used for the project. if it is not present, and you perform mvn-update from within your eclipse, eclipse switches jdk-version back to default jdk-version [1.5] which is annoying. So do add it in your project pom as well. @Controller annotation on class name declares this class as spring bean and @RequestMapping annotation declares that this class is default handler for all requests of type ‘/’. First method does not have any mapping declared so, it will inherit the mapping from mapping declared on class level, acting as default handler for GET requests. Second method (due to additional mapping declaration with value attribute) will serve the request of form /helloagain. Attribute method says which type of HTTP request this method can serve. ModelMap is a Map implementation, which here acting as replacement of [request.getAttribute()/request.setAttribute()]setting values as request attribute. Note that we are returning “welcome” string form this method. This string will be suffixed and prefixed with suffix and prefix defined in view resolver(see spring-servlet.xml above) to form the real view file name. Create a new folder named views under WEB-INF and add in a Simple JSP page welcome.jsp (WEB-INF/views/welcome.jsp) to simply access the model value sent from controller. Add the below mentioned class under src/main/java with specified package as shown below. This configuration class can be treated as a replacement of spring-servlet.xml as it contains all the information required for component-scanning and view resolver. @EnableWebMvc is equivalent to mvc:annotation-driven in XML. It enables support for @Controller-annotated classes that use @RequestMapping to map incoming requests to specific method. @ComponentScan is equivalent to context:component-scan base-package="..." providing with where to look for spring managed beans/classes. Add an initializer class implementing WebApplicationInitializer under src/main/java with specified package as shown below(which in this case acts as replacement of any spring configuration defined in web.xml). During Servlet 3.0 Container startup, this class will be loaded and instantiated and its onStartup method will be called by servlet container. The content above resembles the content of web.xml from previous tutorial as we are using the front-controller DispatherServler, assigning the mapping (url-pattern in xml) and instead of providing the path to spring configuration file(spring-servlet.xml) , here we are registering the Configuration Class. Overall, we are doing the same thing, just the approach is different. One thing to keep in mind that the Spring java based configuration api’s like WebApplicationInitializer depends on Servlet 3.0 containers.So make sure you don’t have any web.xml with servlet declaration less than 3.0. For our case, we have removed web.xml file from our application. Now build the war (either by eclipse as was mentioned in last tutorial) or via maven command line( mvn clean install). Deploy the war to a Servlet 3.0 container . Since here i am using Tomcat, i will simply put this war file into tomcat webapps folder and click on start.bat inside tomcat bin directory.